Remember when 1TB hard drives first hit the market? At the time, that amount of space in a single disk seemed downright exciting. Today, we see 14TB drives at the top-end, and 8TB as a common option for home server builders. That’s all good – but how does a 40TB HDD sound? We take a quick look at some history and explore the future of HDDs using microwaves and lasers. The humble hard drive is a marvel of modern engineering. The mechanical precision involved in reading and writing data from a disk of aluminum, spinning hundreds of times per second, using a magnet that’s hovering nanometers above the surface, without error, for years at a time… it just boggles the mind. While a war has been waging on between solid-state and mechanical hard drives for the last decade, research and development into spinning rust has continued and endured. The main benefit is cost; SSDs, despite advances, are still very expensive when compared to the cost of hard drives, and likely will remain so for the foreseeable future. Yet, there is a constant demand for more storage. Hard drives have gone through phases of density growth over the years, with Perpendicular Magnetic Recording (PMR) being the long-standing standard for the last couple of decades. 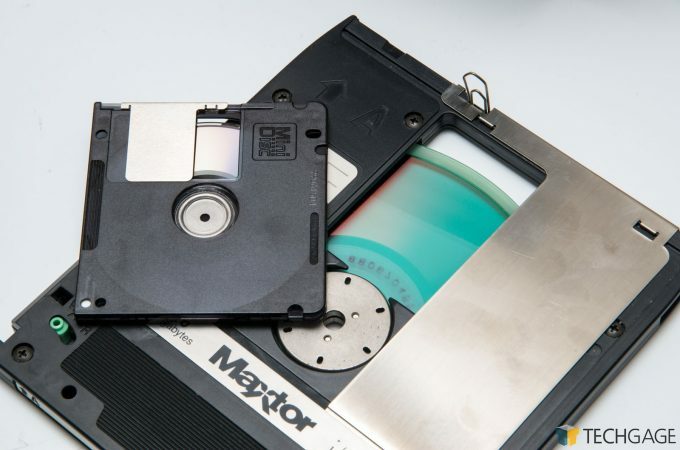 Enterprise storage has experimented with something called Shingled Magnetic Recording (SMR) for the last few years, but it’s a stop-gap technology at best. The truth is, PMR and SMR technology is at the point of diminishing returns; there is only so much more that can be done with it before the costs become greater than alternative technologies. Stop – It’s HAMR Time! Research into alternative recording mechanisms have gone on for just as long as PMR has existed. In fact, some of the front-runners for PMR’s replacement, are in fact very old technologies that have simply been minified. The classic example is something called Heat-Assisted Magnetic Recording, which is delightfully shortened to HAMR. HAMR is an energy-assisted recording technology that was anticipated to replace PMR for the last 10 years or so, but never came to fruition. It turns out that heating a nanoscopic portion of a fast spinning medium is incredibly difficult and unreliable. You see, HAMR shares a number of characteristics with another old technology that’s fallen out of favor over the years, called Magneto-optical (MO). While both use lasers to heat a material and then use a magnetic field to flip bits, the two work in different methods. MO makes use of something called the Kerr effect, whereby a laser heats up the material, making it magnetically pliable, and then a magnetic head moves over, shifts its polarity, and the material goes from transparent to opaque. The laser is used again at a lower power, and reads the disc much like a CD. MO discs, MODs, were used as a high density alternative to tapes in enterprise storage for a long time, but these days, the only modern derivative of the technology is the MiniDisc. HAMR on the other hand, just uses a laser to heat the material to make it magnetically malleable (easier to write), but otherwise uses a normal hard drive read/write head thereafter. The problem with increasing storage densities with PMR is that as each bit gets smaller, so too does the magnetic field. They also become more sensitive to heat, and it’s quite possible for bits to randomly flip just because the hard drive is getting too hot. So why would you want to deliberately make things hotter with a laser? By using a material that is magnetically more stable, has better data retention, and is less prone to inadvertently flipping – but also, more difficult to change state. This means the read/write head needs to be more powerful and/or bigger, which either runs the risk of affecting adjacent bits, or negates any density improvements. By heating the area with a laser to put it in a weaker magnetic state, it becomes easier to flip and you don’t need a more powerful read/write head. So if HAMR solves all these engineering problems and increases densities, why isn’t it used? The material used for the platters costs significantly more, as they’d need to be made of glass, rather than aluminum, since temperatures at the write point can be between 400-700C. The life of a laser is also finite, and any kind of obstruction will reduce its effectiveness. The heat generated eventually causes the platter to decay and carbon deposits to build up on the laser, making it dirty, and even less effective. When you’re dealing with nanoscopic levels of precision, it doesn’t take much to make a laser fuzzy. 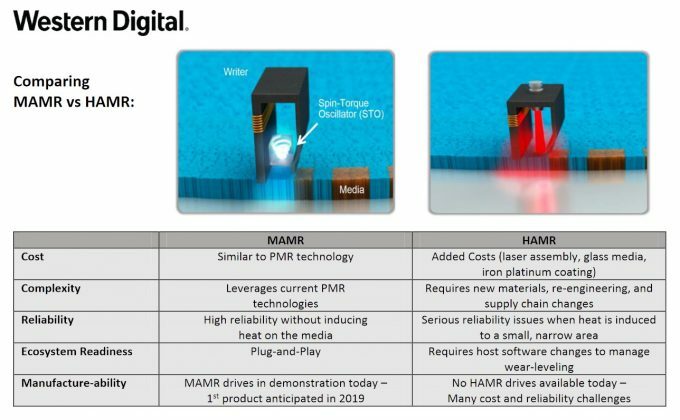 Keeping with the energy-assisted technologies theme, instead of using a laser to heat up a specified media, Western Digital (NASDAQ: WDC) has decided to go an alternative route, using something called Microwave-Assisted Magnetic Recording, or MAMR. You will have to forgive me, because it’s at this point that my understanding of the technology becomes a bit… vague. 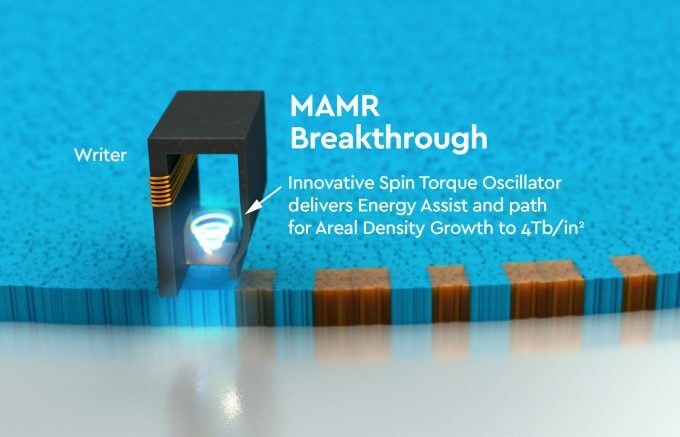 MAMR uses a microwave field created by a Spin Torque Oscillator (STO), to assist the write head. It’s a form of spintronics, or electron-spin based electronics. WD’s own press paper on the specifics is not too forthcoming on the details, and even reading up on what’s involved is a bit tricky. Techgage has no resident scientist, so it’s at this point I can just embarrass myself by trying to figure out what’s going on, based on the loose research I can find. From what I can see, it’s a type of spin-transfer mechanism using a tiny microwave emitter. The STO induces a small current in the platter below the write head, changing the electron’s angular momentum to be more ‘spin-up’ or ‘spin-down’. It’s in this excited state that allows the write head to flip bits at a much lower energy level than that required using the HAMR laser method. No laser, very little heat, nothing to get clogged up; it’s a win all around. According to WD’s research, the MAMR heads last 100x longer than the lasers in HAMR heads. If you are worried about another potential source of microwave energy invading the place, fear not. The energy levels we’re talking here are tiny, and the microwave frequency range is around 20-40GHz, so pretty much all of the energy will remain within the thick shielding of the hard drive casing. In fact, a piece of paper would likely be enough to stop those kinds of energies. With MAMR head in play, platters can be packed more densely, since the media is less likely to flip inadvertently. The net result is that areal densities can go from 1.3 Tbpsi – tera-bits per square inch on PMR, to at least 4.5 Tbpsi using MAMR. It is WD’s expectation to reach hard disk drive capacities of 40 terabytes or more, by 2025. MAMR-based disk drives won’t become available commercially until at least 2019, so there’s still some time left using the old PMR and SMR systems with helium filled drives. 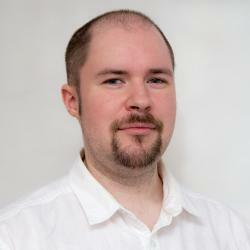 It’s still possible as well that a competitor may introduce a HAMR solution as well, so there is still a lot at play.